In part one of my posts about The Albany Children’s Book Festival, I wrote about some of the first authors and illustrators that we were able to meet and talk with. By this time, the boys were running ahead to check things out. While I was still chatting with Jennifer Berne and Diane deGroat, they continued on along the row of tables. 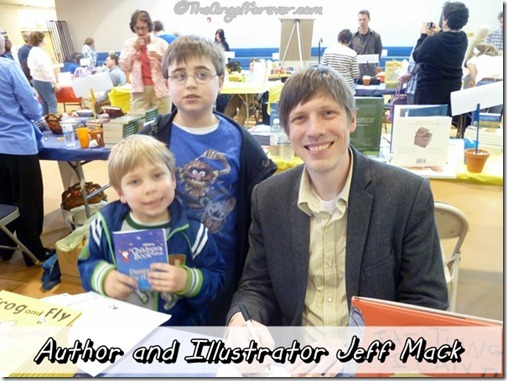 When I caught up with them, they were over with author and illustrator Jeff Mack. I immediately recognized his illustrations from Bunnicula and was thrilled to see that the series now has a Ready-To-Read options for younger readers. In addition to this, Mr. Mack is the author/illustrator of the Hippo and Rabbit books for Beginning Readers (getting these for JSL’s birthday), Clueless McGee chapter books, and many other picture books. The kids loved that he signed their books with a cute little illustration. While I was chatting with someone I know from Albany Kids Out and About, the boys kept moving ahead. When I arrived, JSL and NHL were mesmerized with a private storytelling for just the two of them at a table. 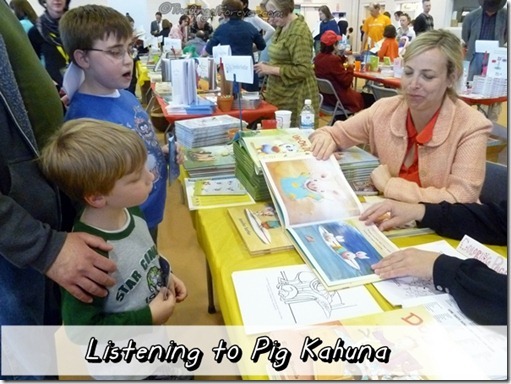 The book was Pig Kahuna and it was written and illustrated by Jennifer Sattler (on the left below). 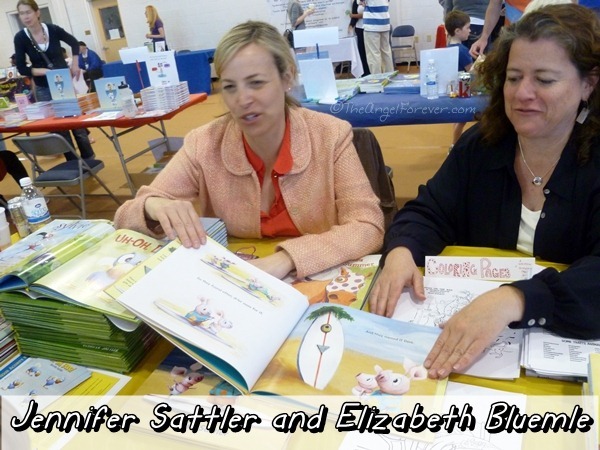 She was not the one that was reading the book to the boys, that was author and co-owner of the The Flying Pig Bookstore Elizabeth Bluemle (on the right below). My heart melted watching the faces on my kids, so I took a photo to share. These two women were amazing, they spent quite some time with NHL and JSL. You could tell that they get children and love to interact with them. 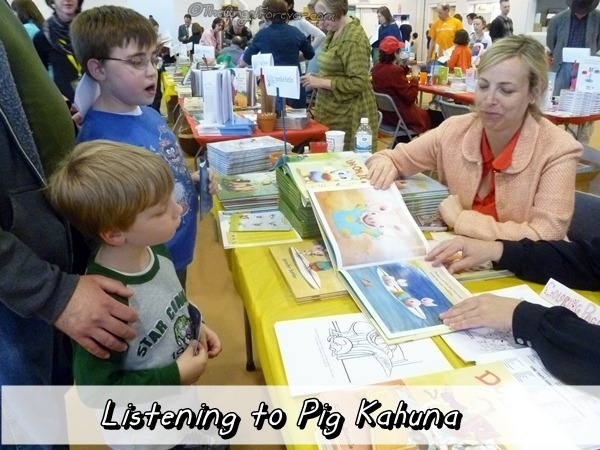 In addition to Pig Kahuna, Ms. Sattler has also written and illustrated quite a variety of other picture books that are now going onto our summer reading list and the kids can’t wait to see Pig Kahuna Pirates! coming in Spring 2014. Ms. Bluemle has written several books for kids including How Do You Wokka-Wokka? which are also going onto our must reads this summer. 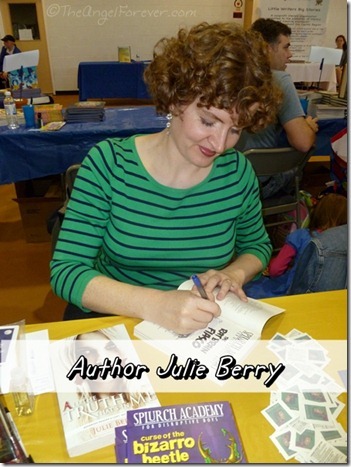 From here, we walked to the end of the row of tables and met author Julie Berry. At first, the boys were getting a little antsy from being in the room for a while. Then something clicked with NHL. As Ms. Berry talked with us about her Splurch Academy for Disruptive Boys series he perked up. He liked that the books also included illustrations, drawn by Ms. Berry’s sister Sally Faye Gardner. When it came time to select a book to purchase, he wanted to go back to get the first from this series. We started reading this book together and I think we are both hooked. NHL has already asked us to order the next three books. This is huge for a reluctant reader who is not typically into fiction books (my Aspie loves reading about math, science, and history). I love that this even helped us to find new books that he wants to read. 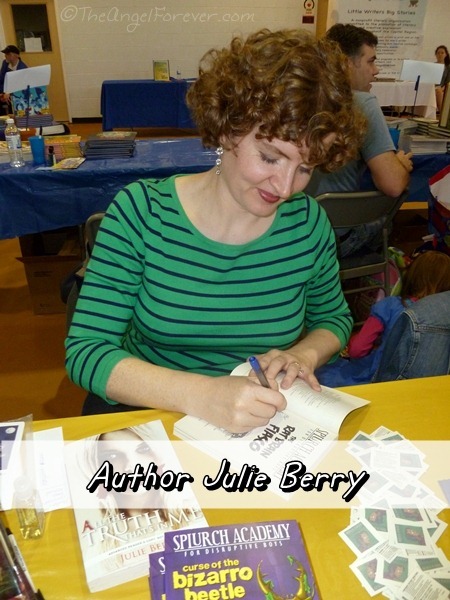 The next part of this series will introduce you to some very talented authors and illustrators that are from the Capital Region. I must say we have a lot of amazing people creating children’s books in our area. Oh and I will also share how JSL finally selected the book he wanted to purchase at the event (it was not an easy task). Oh and if you are curious about the books we read, more will be featured on upcoming Tuesday Tales so stay tuned.